«Komsomolskaya Pravda» and the Channel 1 aired sensational results of genetic analysis. In recollection. 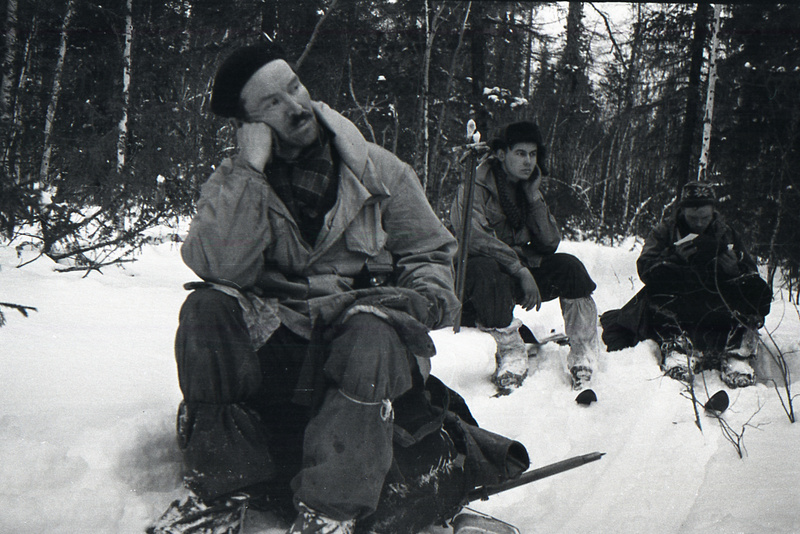 In the winter of 1959, nine hikers led by Igor Dyatlov, a graduate from the Urals Polytechnic Institute disappeared in the north of the Sverdlovsk region. The investigation found that in the middle of the night they, for unclear reasons, cut the tent and fled into the forest without outer clothing and shoes. Six died of hypothermia, and three of them sustained fatal injuries. The causes of the tragedy were never clarified, and the investigation was classified. What was the purpose of the exhumation? 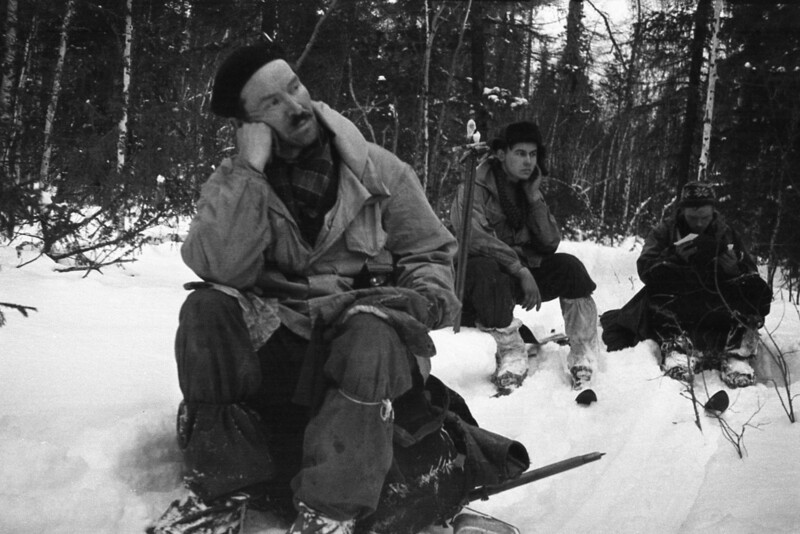 Question: Is it Semyon Zolotaryov who is buried in the grave under the monument to Semyon Zolotaryov, the researchers of the secrets of the Dyatlov Pass have asked this question for a long time. The main reason for this is the strange tattoos on the corpse, presumably Zolotaryov. None of the relatives remembers these tattoos. The condition of the body when discovered was in no condition to be identified. In addition, there is no reliable information that any of his relatives identified him. There was no record of Zolotaryov ever been buried in 1959 at the Ivanovskoe Cemetery in Yekaterinburg. This gave reason to Semyon's relatives to exhume and establish kinship with the help of DNA expertise. Semyon Zolotaryov, as we wrote many times before, is the eldest and most mysterious of the perished group. In that fateful trek, he turned out to be a stranger from outside. The rest of the members of the group were 10-15 years younger and nobody knew the 37-year-old newcomer. Semyon went through the whole war without a single wound. After the end of the war, he did not go straight home, but enlisted the Minsk Institute of Physical Education. Every time he wrote his autobiography, he confused in significant events from his life. He even gave incorrect information about his combat awards. Before leaving for his last expedition Semyon said to his students a mysterious statement: "The whole world will talk about this expedition." And his words turn out to be prophetic. We, journalists of KP, willingly helped Semyon's relatives, because we also needed answers to a number of questions. For example, to establish the nature of bone fractures found on the body of Semyon by forensic expert in 1959. Check the radiation background of the remains, etc. 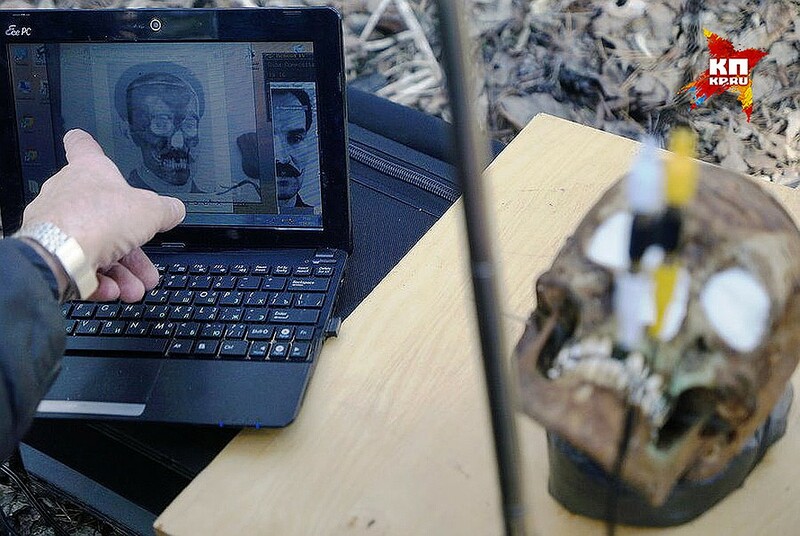 Forensic medical expert Sergei Nikitin performed the method of superimposition of Zolotaryov’s photo and the skull from the grave, directly at the cemetery. Right there on the spot, Nikitin concluded that the person who is captured in the photo is buried in the grave. According to relatives the photo used for the skull superimposition was of undoubtedly of Sеmyon. First examination comparing the DNA of Zolotaryov's bone remains and the DNA of his native niece Tatyana Skulbeda and nephew Pavel Leshchenko. Both are the children of Semyon's sister Mary. And at the moment both are the closest relatives of Semyon. 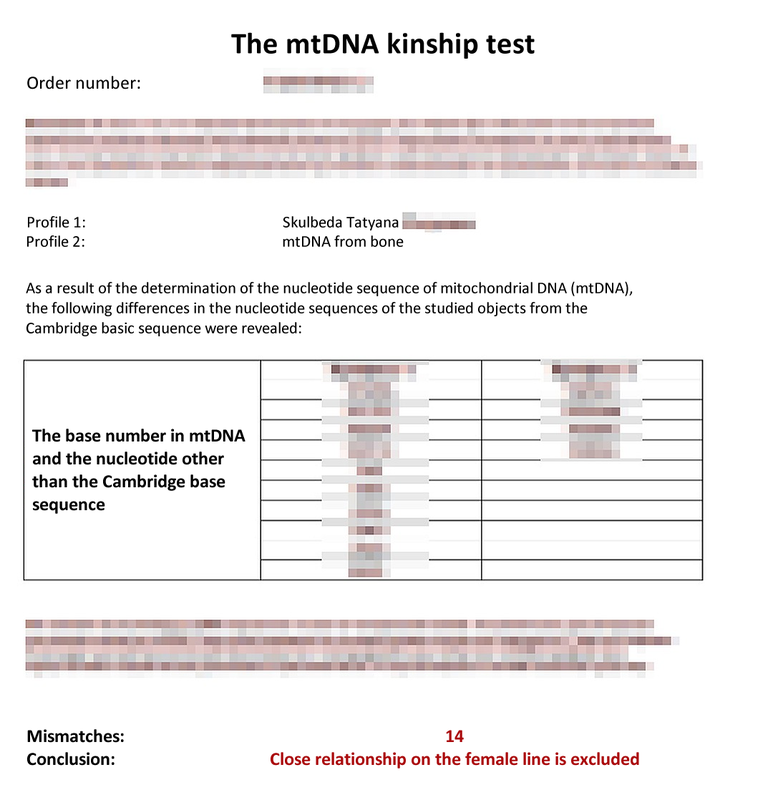 And here the stunning results DNA testing, made with the help of samples from the alleged Semyon and his niece Tatyana. According to the conclusion of a geneticist, the blood relationship on the maternal line is excluded (!). Historical sensation: a DNA test for the most mysterious member of the Dyatlov group. In fact. Issue of 05/16/2018. The investigation into the death of the Dyatlov group continues in the studio, a sensational statement has already been aired that Semyon Zolotaryov, the most mysterious participant in the ill-fated expedition, could have been involved in the death of the Dyatlov group. Perhaps he was an agent implanted in a group of students at the very last moment, and was rescued by special services right after the tragedy. Who is then buried in the grave of Zolotaryov? We talked on the radio about this new sensational secret of Dyatlov Pass on «Komsomolskaya Pravda» (97,2 FM) with the geneticist Aleksey Garkovenko, who conducted the DNA examination. Aleksey, what is the essence of the method that you used in the analysis? In the cells of each person there are organelles (cell particles), which are called mitochondria. They are passed from mother to child. This is the so-called kinship along the female line. The method consists in comparing DNA sections. If the relationship is close, then the sites will be similar. We sequenced* two DNA sections from bone tissue. In one the DNA was unreadable. In the other we got a chain that we could work with. And in it there were 4 mismatches with Tatyana's DNA. If it is more than three, kinship is excluded. * Sequencing is the general name of methods that allow the sequence of nucleotides (biological substances) to be established in a DNA molecule. And how to explain the discrepancy between the skull superimposition and the results obtained by you? Generally, genetics is a more accurate method. And I have no doubt about the results. Aleksey, there is an opinion that DNA extraction from bone tissue takes quite a long time - up to three weeks. And you have finished in three days! Takes a long time? This is complete nonsense! Look how it works. The bone is grinded, filled with an enzyme solution, the cells are cleaved and a full comparative analysis can be obtained in a day. The bone that you, the journalists of the Komsomolka, provided were dissolved for 8 hours. It took another 1.5 hours to compare to the other DNA and get the results. This is the standard procedure. But you were not able to get results right away. It's true. We first isolated nuclear DNA (the Y-chromosome in the male line), but it turn out to be broken. Very bad in that. Then we decided to look at the mitochondrial DNA along the female line. And it turned out to be good. How often do you have to extract DNA from bones of such a long time ago? It is rare. Usually the bones not more that 10 years old. But one time we isolated nuclear DNA from bones 400 years ago. And how do you establish kinship? I'll explain as easily as possible. We are all ancestors from one woman in this or that perspective. And when analyzing, we always consider how the common ancestors of those people whose DNA we compare have long ago dispersed. And as for your expertise, the common cells of the alleged Seeds and his niece Tatyana diverged more than 1000 years ago! That is, they can not be relatives not that in the next three generations, but even deeper. To be honest, it's very difficult to believe in such stunning results. Almost impossible! I can’t help it. I am confident in these results by 100 percent. On the air of the radio "Komsomolskaya Pravda" we called the famous forensic expert Eduard Tumanov and asked his opinion. 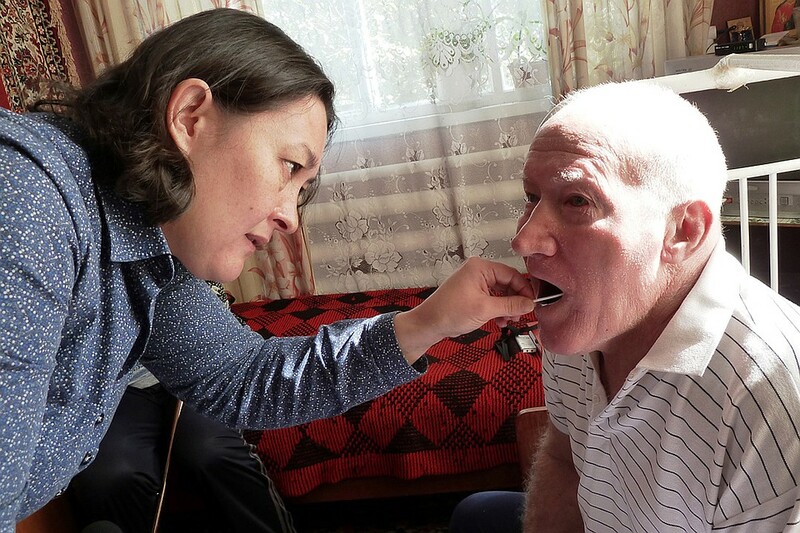 This is not an examination of direct kinship, so there are questions about it, - said Tumanov. - I don’t want to question the professionalism of these geneticists, but private laboratories, as far as I know, do not have enough experience to carry out examinations of this degree of complexity. I believe that you need to contact the Russian Center for Forensic Medical Examination. They have both skills and equipment for conducting such studies more weighty. We called Julia Orehova, Semyon Zolotaryov's grandniece. We are shocked by this result, - Julia shared with us. - We were sure that Simyon Zolotaryov would be in the grave. And if it's not him, then we need to file an application with the investigative committee with a request to open a criminal case and find out who was buried in 1959 under a memorable sign with a tablet bearing the name of our relative. Honestly, we were not ready for such an unexpected conclusion of the examination. After all, if Semyon Zolotaryov is not buried at the Ivanovskoe Cemetery in Yekaterinburg, then who? And where did Zolotaryov go from the scene of the tragedy? Or where did the body of Semyon Zolotaryov go? Julia is right that you need to contact the authorities with these questions, but we have so far asked her to wait. In the near future, we will conduct a more extensive DNA analysis at the Russian Forensic Center, where specialists will compare the DNA of the sister and brother - Pavel Leshchenko and Tatyana Skulbeda, to make sure of their kinship. And then they will compare the bone DNA of the alleged Semyon Zolotaryov and his both nephews. In addition, we hope that other relatives of Semyon will agree to submit their samples for more accurate analysis. But if the second examination also confirms the conclusion of the first, then the picture of the events on the pass will be even more mysterious and will require direct investigation by the competent authorities.